Want an under 30 minute dinner that’s protein- and veggie-packed? Try this Broccoli Cheddar Frittata recipe. Combine broccoli and water in 10-inch nonstick skillet. Cook over medium heat until tender, stirring occasionally to break up broccoli, about 10 minutes; drain well. Coat same skillet with cooking spray; heat over medium heat until hot. Pour in egg mixture; cook over low to medium heat until eggs are almost set, 8 to 10 minutes. Remove from heat. Cover and let stand until eggs are completely set and no visible liquid egg remains, 8 to 10 minutes. Cut into wedges. 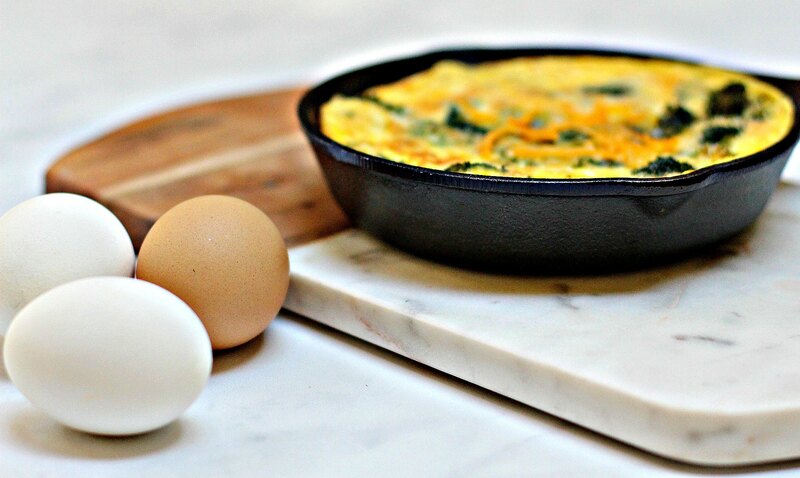 Broiler option: After removing from heat, frittata can be broiled, 6 inches from heat until eggs are completely set and no visible liquid egg remains, 2 to 3 minutes. Three ways to serve a frittata: Serve wedges right from pan, slide uncut frittata topside-up onto platter, or invert it onto platter to show its nicely-browned bottom. Adapted from the American Egg Board. This post is part of an educational partnership with the American Egg Board. Thank you, Cannot express enough, too many pre make food that are not healthy, hope more young mother, rely on those…..